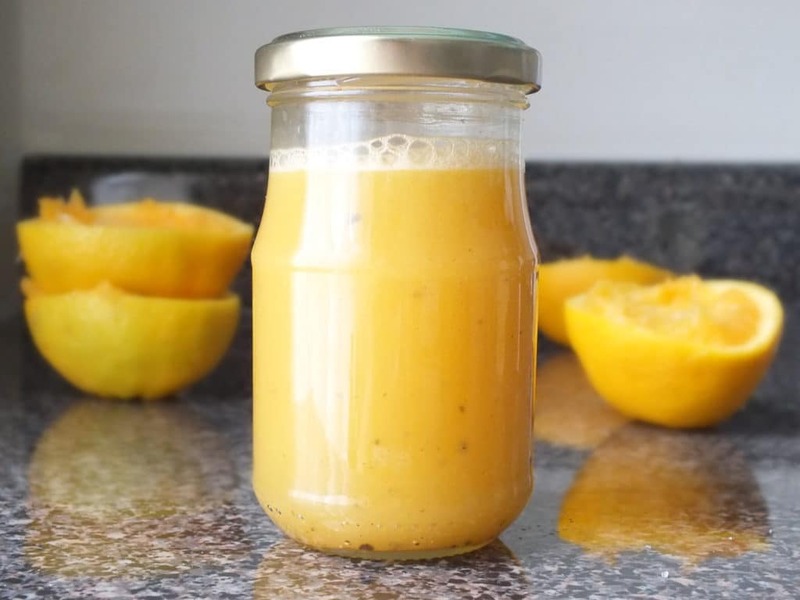 This recipe for orange dressing is our favorite homemade version. We make a big batch and store it in a jar until we run out. That way, it’s always on hand when a salad craving strikes and it only takes 5 minutes to make more when we finish it off. I love to pair it with mason jar salads for a quick, portable lunch! Whenever I get tired of this dressing, I mix it up with our raspberry or lemon version – both as just as healthy and equally easy to make. Why should you make your own salad dressing? It’s simple! When it comes to salad dressing, there are a lot of issues. There are too many misleading labels such as “light,” “low-fat,” and “sugar-free” — all strategically worded for the purpose of fooling the consumer. Organic varieties are too pricey. Moral of the story? There is no reason to pay $4-5 for ambiguously-labeled salad dressing when you can easily make your own healthy version for half the cost. Let’s take a moment to consider the purpose of salad dressing. We use it to add flavor to a bed of greens and to make the leafy goodness easier to chew and swallow. With that in mind, shouldn’t dressing be more of a supplement than the main attraction? Sure, it should taste good. But it shouldn’t be a crutch that we use to drown and choke down a salad. Salads are pretty delicious in their own respect, especially when paired with a dressing that brings out the best in them. A light citrus dressing that’s easy and mess-free. It can be whipped up in under 5 minutes and pairs well with infinite salad ingredients. In a food processor or blender, combine all of the ingredients and blend until smooth. You can also make the dressing without either appliance. Just add everything to a bowl and whisk vigorously. Makes approximately 8 ounces of dressing. Store in refrigerator up to 1 month. This is super easy and very delicious! I highly recommend over store bought , artificial and processed dressings. The recipie is perfect! But does not make very much. If you eat a lot of salad and want some to be premade I suggest doubling this . I’m glad you liked this dressing – I agree, it’s so yummy! I will definitely make this. Just tried a bought orange dressing . It was delicious & it had garlic & mixed herbs as well. Maybe you could also try that?!! My dressing does not thicken. I have tried three times. Hmmm… that’s very strange. I will say that this dressing doesn’t get super thick. It doesn’t turn out like a creamy ranch – more like a vinaigrette. I don’t know what the problem might be! Great dressing! I put it on a mandolin-sliced Brussel Sprout, Sweet Pepper, Bacon, and Misc. Greens Salad. With some Almonds, Green Onion, and Avocado, it was delish. The friend I had over for lunch loved it, too. What do you think of a duck egg salad, with spinach and asparagus with this dressing? I dun have white wine vinegar can i use apple vinegar? Serve warm on Jasmine rice with fresh cilantro beside jerk or just grilled chicken with mango salsa…mmmm! Yum! That sounds delicious, Susan! Doubled this recipe for my family of five. Loved this dressing. It was light and very flavorful. I will definitely make this again. This dressing is delicious! My 8 year old said it is her new favorite “sauce”. Thanks for sharing! breasts in. Added garlic & crushed red pepper to the marinade. dressing is light & fresh.